Mighty, Mighty Bosstones is a Boston ska staple and my BFF Julie's favorite band ever. We've seen them live several times and they never disappoint. "Don't Worry Desmond Dekker" is from their 2007 album Medium Rare and it's one of our favorite songs to sing; especially live! I am fortunate enough to have an amazing support system of family, friends, co-workers to rally behind my efforts in weight-loss, career moves, writing goals etc. However there is one person whom I would be totally lost without and I thought it was about time she got her own post. Julie and I met in 2002 at college. She was a TV major, I was finishing my audio degree and continuing on for a TV degree and I worked in Studio Ops (camera / gear / studio rental). She and her lab partner, Steve would always come rent cameras during my shift and I vowed we would be friends because she looked so nice and the school was 99% male dominated. This began our friendship (and a cycle of me making what I want happen, haha). We graduated college in 2003 and while I went off to work she went to another school and got her Bachelor's degree. We kept in touch, saw each other for dinner and emailed but we truly became BFF in 2005 when she moved to NYC to chase a dream and we found ourselves on G*Chat at work for hours at a time. Couple that with weekly 3 hour phone conversations about EVERYTHING (life, family, love, dreams, fears....no subject is off-limits) and something magical is born.Julie is one of those people who you can just *be* around - be yourself, be honest, be unfiltered. Julie has supported me through career changes, broken hearts, new crushes (and the over-analyzing that comes with newness), weight loss victories and failures....life. 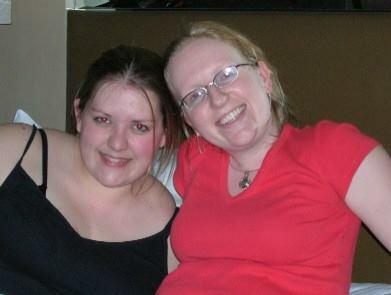 She has had my back for over a decade in all that I do (and vice versa!). We have shared so many life events times from "I quits" to "I'm in love" to "I can't do this anymore" to "I'm lost" to "What does this MEAN?" to "Where do I go from here?". She is the first person I text (or call) when I'm excited or sad or scared. When she's away even for a week I have a LIST of things to be discussed and she knows me better than I know myself sometimes (and she doesn't let me forget who I am or what I stand for - even if I have a momentary lapse in judgement, haha). Julie is living in central Mass now and immersed in a second Bachelor's program in nursing. Later this month she starts her internship then will be taking the boards and looking for jobs come the winter. She's come so far from the girl I knew in 2002 and I'm so proud of her for following her dream and putting herself out there. No one is more adept at the reinvention of themselves than Julie. I am on the verge of a breakthrough - with weight-loss, with life goals, with self-discovery. But yet, we still totally fit together in a way that you can't explain. We have seen each other grown and evolve (and devolve only to re-evolve, lol) so many times it's not funny. I would be lost without her and I can't wait to see where this next chapter of our lives take both of us (hopefully it includes cute men who become our future husbands and babies because I can't think of anyone I would like to share those milestones with more than her! ).